Turmeric and ginger, two amazingly versatile and valuable spices, used for thousands of years in Chinese and Ayurvedic medicine. Included in the therapeutic qualities of turmeric's bioactive ingredient; curcumin, are its activity as an anti-inflammatory, antimicrobial, anti-cancer and the fact that it can cross the blood-brain barrier. Thus curcumin has become a powerful tool in the repair and regeneration of neurons and in the treatment and prevention of diseases such as Alzheimer's and Parkinson's. We've been using turmeric for years now both as a delicious addition to recipes, as a vegetable and for the health of ourselves and our poultry. 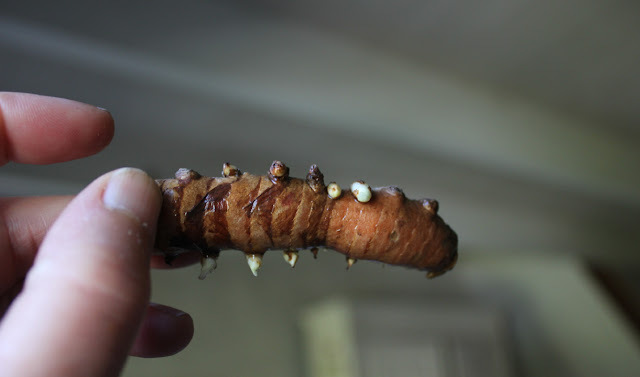 Although we have always been able to get dried organic turmeric very easily, I've always wanted to grow my own and a few years ago now my local organic shop had turmeric rhizomes in stock. Ginger, another traditional medicinal plant is also an anti-inflammatory, anti-microbial and has anti-cancer properties. It is also used to aid digestion, in the treatment of asthma and migraine and is great for travel and motion sickness. I've always been an experimental gardener, I get this from my grandfather, who was actually supposed to be a farmer but never gave up his first love and profession, gardening. I had read that you couldn't start turmeric to root in water so I thought I'd experiment and find out why. I'd already started a large organic ginger root in water and didn't see why this couldn't work for turmeric. You don't need a greenhouse to grow these spices but in these Northern latitudes it helps to have a little tropical paradise! 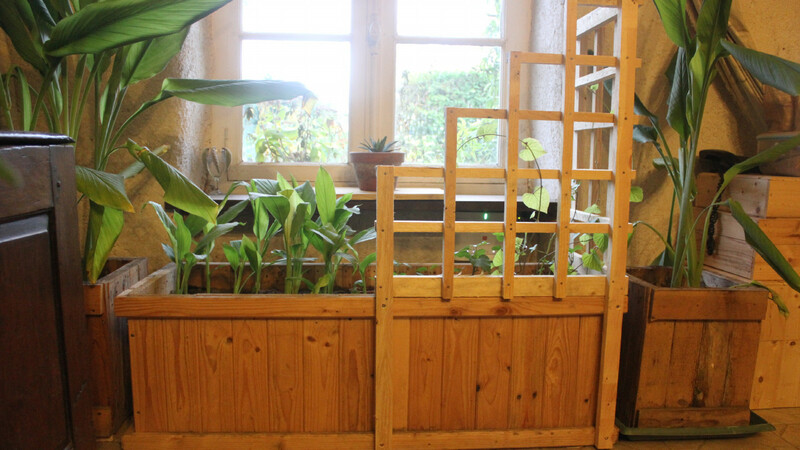 This is our own design greenhouse made from recuperated windows and untreated pallet wood. We can get organic ginger roots from the Cameroons, China and Peru in my local shop, I've grown all three and compared notes with other gardeners and found the Chinese one grows best here in Normandie. So ask around and find which variety is best for your climate. Ginger grows really well in water, I just leave it out in our kitchen for a week or so just to allow the buds to start to form. Then I balance it over a jug of tepid water just so the base of each bud or eye touches the surface. It is from these eyes that the roots will emerge. Below is the impressive root structure, which had formed a month later from the beginnings of the root on the left. 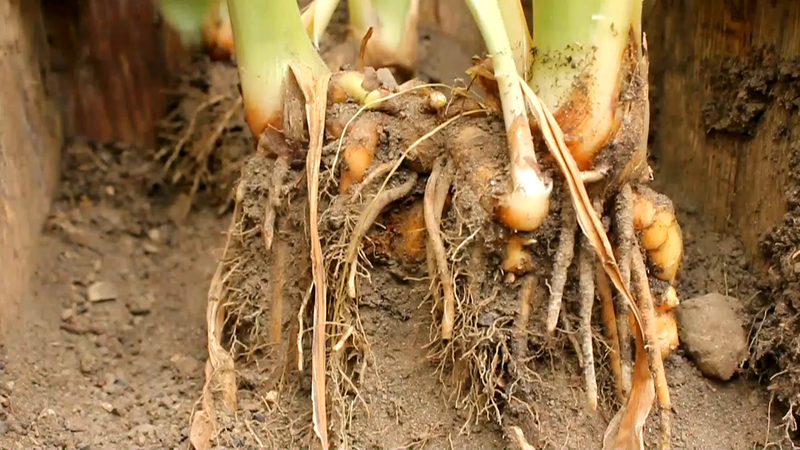 This ginger is now ready to plant into a planter either in a sheltered part of the garden or a cool greenhouse. There you can just leave it to get on with growing. In the greenhouse I put a small terracotta pot in my planter, my cheap version of the olla pot system. This way the plant regulates its own water supply, if you can't find these sort of pots, I picked them up for centimes in a thrift shop, then an ordinary terracotta flower pot with a cork in the drainage hole will work. I had read that turmeric went mouldy if started in water but I was determined to try, as I believed it would give it a much better start. I did the same thing as with the ginger and just left the rhizome out in the kitchen to see what would develop, I had read however that turmeric needed to be at 25°C around 77°F to start into growth. So I had it originally in a glass case but I later put it in our sunny front window sill. I tried two methods, suspending the rhizome over water and putting the rhizomes directly into shallow water. Both ways worked. The water needed just to come up to the bottom of the 'eyes' or buds. I did have just one rhizome go mouldy, but as the plant was already growing I was sure it was just surface mould and added a drop of organic grapefruit seed extract to an egg cup of water and just swished the root about in it. You can see from this control that the plant on the left, which was started in water made much greater progress than the one on the right, which was just put into soil at the same time. 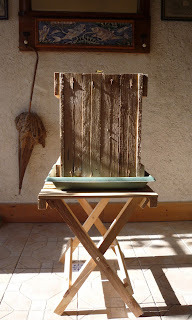 I used a drop-down sided planter which Andy had designed and made from untreated pallet wood the link for it is at the end of this piece. This meant that if I wanted to transfer the plant to another container or into the garden, I could do it with minimal stress to the root. It also meant it would be easy to harvest, but more of this later. The growing medium I used was our own, organic home-made compost, which is very rich as we have pigeons, chickens and quail. I put in a thick layer at the bottom of the planter and then added our ordinary garden soil, this however is clay schist, so is fertile. As I did with the ginger, I used one of my little terracotta pots, so the plant could regulate its own water. If we were living in the tropics, harvesting the whole plant would be fine but here we really don't have the growing period to do that. I show the harvest of the whole plant in the film for information but the best way I have found is to dig gently down with the fingers into the soil and break off individual rhizomes as and when we need them. 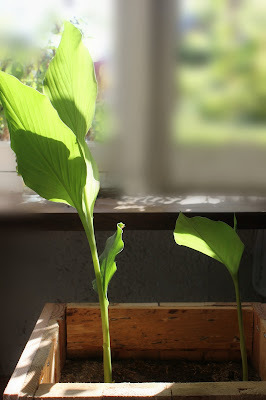 I over-winter the turmeric in the planters in the kitchen, which is warm enough to keep them green and in leaf thoughout the Winter. This means I am able to use the leaves too in cooking, such as for wrapping fish and steamed coconut cakes. The aromatic smell which emanates from the leaves when brushed past them in the kitchen, is an added bonus. I find the old leaves begin to die back in Spring as the new shoots start to break through. 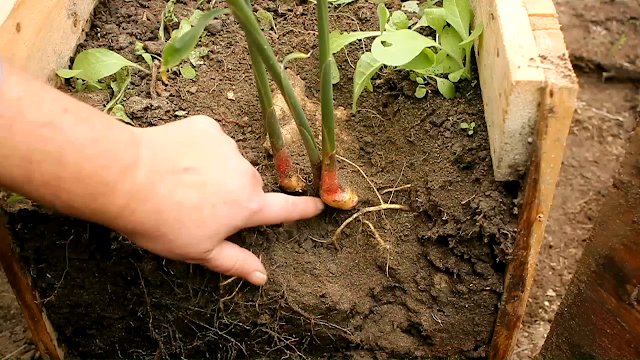 I also start more rhizomes off in the Winter too, as my best harvests seem to come from doing this. You can use turmeric in so many dishes, for example for two really simple ways to use it: we put it in scrambled eggs and we mix it with organic coconut oil and then add it to boiled rice. For the body to absorb it at optimum, we like to add a little black pepper, as piperine stimulates digestive enzymes, thus increases the bioavailability of the curcumin in the turmeric. Similarly with a fat, such as coconut oil, turmeric and thus curcumin are fat soluble, so combining them with coconut oil makes for easier access to the gut, where recent research shows us 80% of our immune system is located. 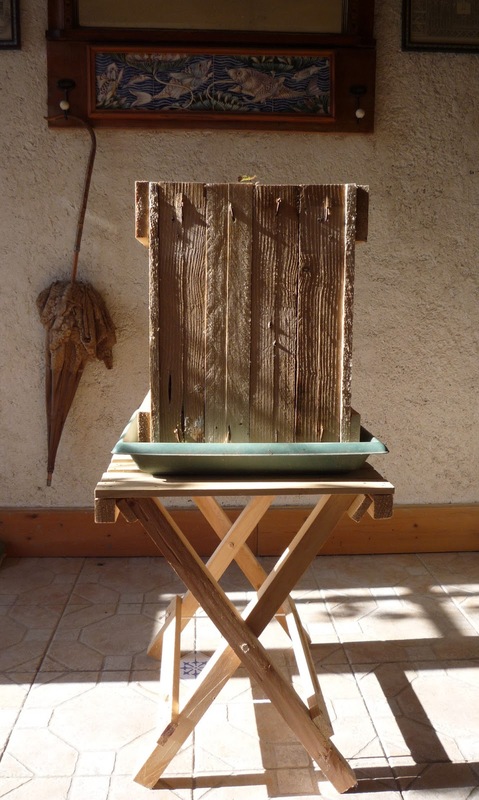 ..... and now if you would like to, sit back and watch the films, one on growing, one intermediate and showing my set up in the greenhouse and one on harvesting. If you've enjoyed this post then please feel free to share it, ask questions and/or comment. Very interesting and clear. Thanks. I have some tumeric in a pot in my shabby little green house but I think I will move it to the house for the winter. Does it need a lot of light? Where are you in Normandie?